﻿﻿ Each week Darrell Bourque, former poet laureate of Louisiana, hosts a poetry show called “From the Poet’s Bookshelf” that is broadcast on KRVS Public Radio, 88.7 FM, Lafayette and Lake Charles, Louisiana. He reads from the works of Louisiana poets and from the works of poets inspired by Louisiana. 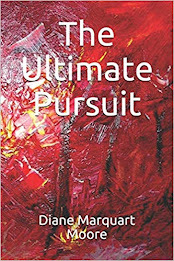 Shortly after I returned to Louisiana in October, Darrell sent me a schedule showing that on December 6, he’d read one of my poems, “Carson City Nevada,” featured in the Pinyon Review published by Pinyon Publishing in Montrose, Colorado. 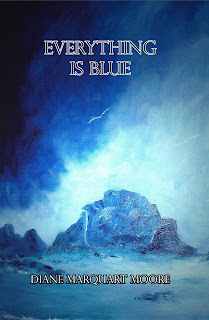 Later, after reading my newest book of poetry, Everything Is Blue, Darrell selected “In Memory of Mint” and “Drought” to read on his radio show this coming year. I’m honored to join Darrell’s cast of poets and to celebrate the efforts of this outstanding Louisiana poet whose authentic voice has inspired so many fellow poets. Darrell once wrote “I think the poet has at least as one of his jobs to remind us that there is something miraculous in the everyday.” He might have added that he does something daily to remind us that poetry is necessary for the human spirit – through poetry workshops, public readings and a radio show, as a sponsor for poetry programs in libraries and community centers, and most recently, Darrell read to help celebrate “100 Thousand for Poets for Change,” a program of poetry, music and art focusing on Freedom of Speech, peace, environmental issues, and social concerns. 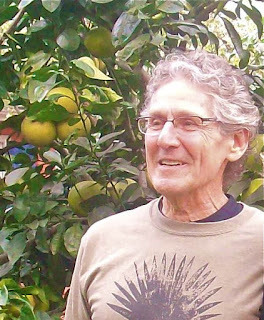 This event touts poets as the “unacknowledged legislators of the world who often spread the real news.” In 2011, 650 Poets for Change events were held in 95 countries, and in Mexico City, poets read in an attempt to "encourage reflection and creative responses against systemic violence." Darrell was not only a former poet laureate of Louisiana, he’s Professor Emeritus in English at the University of Louisiana in Lafayette and has broadcast on “Poets for Living Waters,” served as president of the National Association for Humanities Education and as editor-in-chief of this association’s journal. He has been instrumental in supporting the work of the “Festival of Words” in Grand Coteau, Louisiana and was director for the project, “Significant Voices” which featured young African American writers from Louisiana. An annual award, the Darrell Bourque Award, has been established by the Louisiana Conference on Literature, Language and Culture. 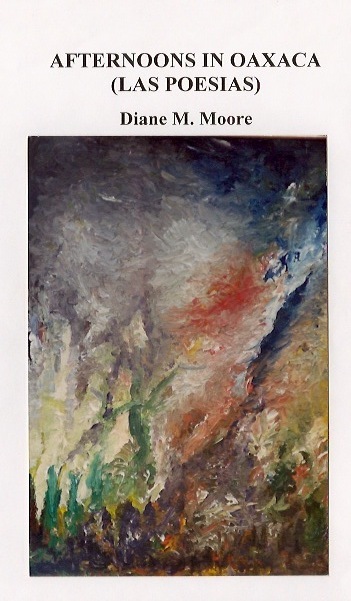 Darrell’s latest chapbook, Holding the Notes, was published by Chicory Bloom Press, and he has just completed a collection of poems about the coming of the Acadians to south Louisiana that will be published by the ULL Press in Lafayette, Louisiana. have fallen before the Fall. What do you know of hunger and loss? This life offers no safety. unsettling boundaries of forest and yard. a miracle to satisfy her trembling desire. Photograph of Darrell Bourque by Vickie Sullivan. Cover of Everything Is Blue from a painting by my brother, Paul Marquart. I doubt that most readers observed Thanksgiving by visiting a cemetery, but it seemed a meet time for me to visit Ellis Cemetery in Franklinton, Louisiana, where most of my relatives are buried. I wondered if the cemetery had been named after my Grandfather Paul Greenlaw’s middle name, Ellis. Some local citizens believed that his initials, P.E.G., indicated that he’d be prosperous (which he became) because the bearer of a name having initials that spell another word will inevitably become wealthy. Such are the superstitious countrynisms of a small town in southeast Louisiana where so many of my recent ancestors lived and died. Cemeteries can be sad places, but as I stood in the bright November sunlight, I began to feel connectedness and peace, and a line from one of my funeral homilies came to me: “They go to the father, and they remain with us.” Even the great-grandparents, whom I never knew but whose stories I had heard many times, were with me, “in still small accents whispering from the ground…a grateful earnest of eternal peace…” (Gray’s “Elegy Written In A Country Graveyard”). I enjoyed one of those peak moments when communication comes from a source beyond and was strengthened by their spiritual presence. For perhaps thirty minutes, I walked among my antecedents, noting that their headstones needed cleaning or that I should preserve the inscriptions in rubbings. This is a process where butcher paper is taped to the headstones with masking tape and charcoal or crayon is rubbed over the stone to make the etched lines appear without the engravings being touched by the charcoal or crayon. When the paper is removed, all the words appear just as they were initially etched into the stone. about the One Whom None Can Hinder. ﻿ Thirty-four years ago, I wrote an article about three enterprising young brothers who started a home-based pecan cracking business called “The Nutcrackers,” operated by the Regard boys of New Iberia, Louisiana. You can imagine how delighted I was a few days ago when I walked into the offices of the Cane River Pecan Company here in New Iberia and shook hands with Jady Henry Regard, CNO (Chief Nut Officer) of the original “Nutcrackers” business. However, the ultimate surprise hung on the walls of the office – a framed copy of a thirty-four year old article entitled “Pecan Businessmen Beginning Young,” with my by-line, the ink on the paper as sharp and dark as the day the feature article first rolled off the presses of The Daily Iberian. Jady called in some of his staff to meet me, and I stood in the lobby of the office, sampling some of the finest gourmet quality pecans I’ve ever tasted. I had ordered a tin of the delicious pecans last winter when I arrived for my winter sojourn in New Iberia and later discovered that the company had an office and warehouse on Easy Street in New Iberia. In the article about the “Nutcrackers” that appeared in the Sunday Iberian, I reported that the boys’ father, Dan Regard (now deceased), owned a pecan grove on the plantation “Alcock Place” in Natchitoches, Louisiana and had employed his sons to spend their after school hours and holidays cracking approximately 400 pounds of pecans a week, using a huge nutrcracking machine he ordered from San Antonio, Texas. The boys sold pecans from a shop adjoining the Regard home on Darby Lane. “We needed spending money and our dad believed in teaching us to work,” Jady said. The brothers put signs in store windows and advertised in The Daily Iberian during the start-up years of their enterprise. 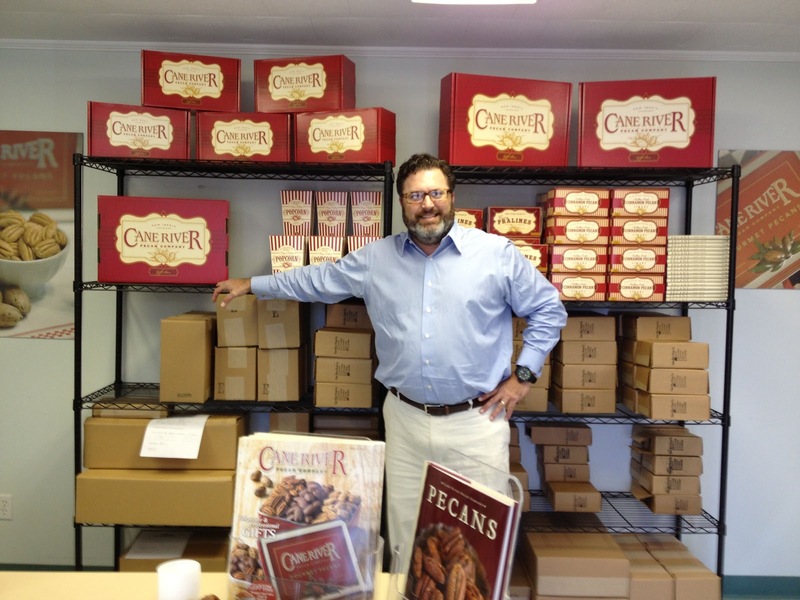 ﻿ Today, The Cane River Pecan Company grosses approximately $2 million in sales and sells pecans as far afield as Singapore, employing thirty people to prepare the handsome Cane River Company tins that contain a variety of products: roasted and salted pecans, chocolate covered and praline pecans, fresh-baked pecan chocolate chunk cookies, pecan pralines, and pecan praline popcorn. Jady once worked as manager of corporate sales for the Chicago Bears and for the LSU Basketball team before he began marketing full-time for Cane River Pecan Company. 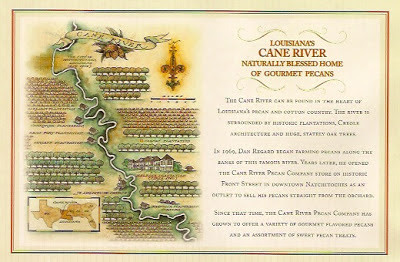 He often distributes a Cane River map by artist Mike Reagan that showcases sketches of the great plantations in Cane River country. “I just give copies away to nice people," he said, flashing a smile at me, and I could see why the Cane River Pecan Company business burgeoned. A long road leads from the home-based “Nutrackers” enterprise to the Cane River Pecan Company on Easy Street – but then a long road leads from this feature writer’s career at The Daily Iberian to present-day book writing. If you’re interested in seeing the wares of this company, you can log on to www.caneriverpecan.com. Corporations can order custom gift tins that feature their own logo and message on the lid of the tins. The company also features a tin with a reproduction of “Pecan Threshing” by Clementine Hunter, the famous Louisiana painter who lived and worked on Melrose Plantation near Natchitoches, Louisiana. 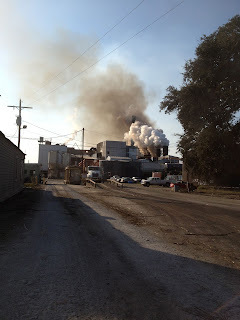 ﻿ The smell of smoke and boiling sugar lingers in the air. In Iberia and other parishes of Louisiana, it’s sugar cane grinding season, a season that begins in late September and ends in January. 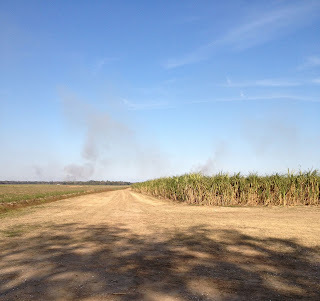 When I was associate editor of Acadiana Lifestyle, our sugar cane issue was published in January, and I learned a lot about sugar cane farming during the five years I wrote articles about this industry. ﻿The new machine that I wrote about was called the Louisiana Two-row Green Cane Combine and originated with Walter Landry, then president of Agronomics, International, Inc. Lately, each time I pass a cane field in the parish, I wonder if the machine is currently being used to harvest cane. On that misty morning during grinding season in 1994, the large red harvester moved slowly through a field of cane, and the combine cut stalks of cane into 13-inch billets before extracting leaf from the cane, which was sucked through the extractor to be deposited back on top of the soil. At that time, the machine could cut 75 tons of sugar cane per hour and was put through its paces on the kind of day sugar cane farmers detest. Light rain fell on us as we watched the machine at work, and black mud oozed onto the roads between the sugar cane fields. The scene was a far cry from the day of cane cutting by hand when slaves cut cane with special knives that resembled a machete with a hook on the end. The slaves had to lop off the top of the stalk, then cut the cane from the roots at the level of the ground. 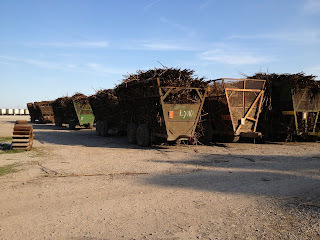 Other workers loaded the stalks on two-wheeled carts to move them to the sugar house or mill. During wet fall seasons, those heavily-loaded carts created a muddy mess on the farm roads. ﻿The demonstration of the new harvester fascinated me. By extracting the leaf and putting it back into the soil, the machine assured that cane would no longer need to be burned, and organic matter would be returned to enrich the soil. A directional loading device on top of the machine placed cane into a container, which enabled cane to be loaded at any point in the field. As I watched the huge machine, two other demonstrations began – one of a transport system and fork lift, the brainchild of J. Randolph Roane – and another piece of transport equipment that originated with Agronomics International, Inc. The transport systems were developed to transport billeted and full stalk cane to nearby sugar mills. These harvesting systems were touted to be a boon to the sugar industry as they had been designed for Louisiana conditions and would increase sugar recovery by reducing the need for field burning of cane and improving cane transport (at the time huge carts behind tractors were the major means of transporting sugar cane to the mill). ﻿﻿Since I have no occasion to trek into the sugar cane fields, I’m curious to know if the harvesters are used today. If burning of cane residue has been reduced, brava! I think I missed the pre-harvest burn, if it occurred, but post-harvest burns are also part of the process yet to come! Right now, there’s still enough dust and smoke in the air to inspire a good case of sneezes, which I’m presently undergoing. However, far be it from me to complain about an industry that moves about 14 million tons of sugar cane on some of our corduroy roads to Louisiana mills. 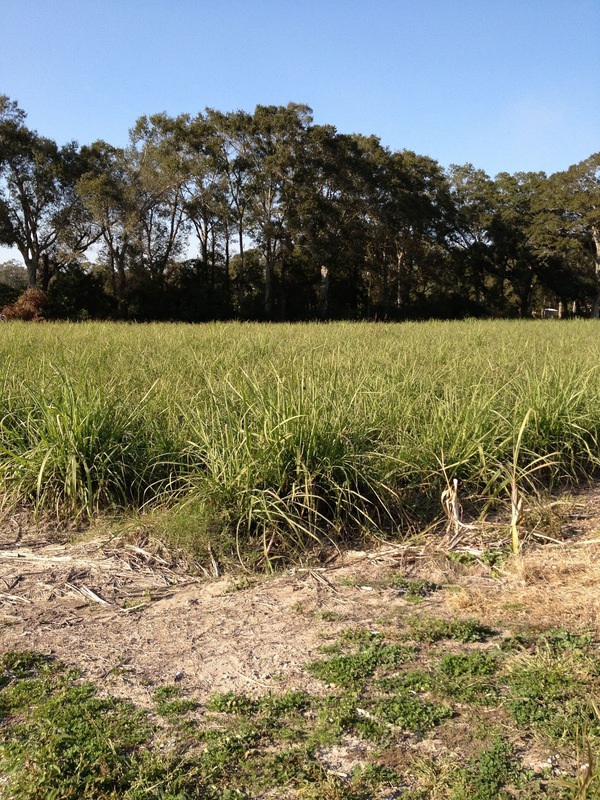 According to reports from the American Sugar Cane League, the sugar cane industry has an annual impact of $1.1 billion in Louisiana. The industry has moved a long way from the early 1800’s when farmers turned to sugar production following Etienne Bore’s development of a process for making sugar, and Teche country became a major player in the burgeoning industry. Saturday evening, while other literary enthusiasts enjoyed the highly-successful Flannery O’Connor Symposium organized by Dr. Mary Ann Wilson at the University of Louisiana at Lafayette this week-end, some of us attended sessions of the Festival of Words that culminated in readings by Louisiana poet laureate, Julie Kane, and award-winning author, Randall Kenan in the St. Charles Chapel (formerly Christ the King Church), Grand Coteau, Louisiana. Grand Coteau is a small town located on a ridge where ancient oaks create alleys and groves, and French, Acadian, Victorian, and Creole architecture is represented in the town’s residences and stores. It’s a lovely venue for literary and art festivals. I recently wrote about the Festival of Words, a program taught by acclaimed authors in Creative Writing workshops to promote creativity and literacy. The program has a special focus on young people who frequently do readings at drive-by businesses, in schools, and at Casa Azul in Grand Coteau, Louisiana. The Saturday night readings attracted an adult crowd and must have had the saints reeling with laughter in that sacred space of the Chapel. Randall Kenan led off with a short story, “New York City,” followed by Julie Kane’s whimsical rhyming poetry from several of her books. Kane ‘s rendition of poems using some of Emily Dickinson’s first lines, which she finished in her own version of “I Heard A Fly Buzz When I Died,” “Because I Could Not Stop for Death,” etc. brought down the house. Julie Kane, a native of Boston, has been a resident of Louisiana for many years and teaches at Northwestern State University in Natchitoches, Louisiana. She has been garnering awards that include a stint as Writer-in-Residence at Tulane University and Fulbright Scholar at Vilnius Pedagogical University, as well as a 2007 SIBA book Award Finalist, and her poems have appeared in the Antioch Review, Prairie Schooner, London Magazine, Feminist Studies and others. Kane’s repertoire includes Body and Soul and Rhythm and Booze,and she’s noted for her volume of poetry about post Katrina entitled Jazz Funeral. 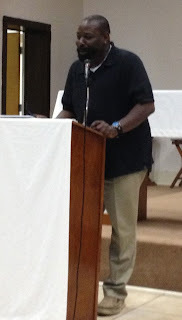 I’m a latecomer to the Festival of Words, but Saturday evening’s program convinced me that literature in south Louisiana is still alive and well, and programs like Festival of Words at Grand Coteau and the Flannery O’Connor Symposium at ULL continue to feature gifted writers and artists from within the borders of Cajun country and farther afield. My next field trip is slated for Arnaudville, Louisiana, a small town near Lafayette, where the same kind of cultural activity has been going on for several years. It’s good to be back in Acadiana and to be part of the joie de vivre characteristic of this part of the world. Today, I read a definition of family that resonated with me, and I was happy to discover that there weren’t any phony, sentimental aspects to the definition. “Family means no one gets left behind,” the short phrase read. I am sitting here looking out at a statue of St. Francis standing on the patio, tending his family of birds and squirrels, and I say, “Yes, family means no one gets left behind,” even God’s creatures that play around the base of the oak in my backyard, and especially under such guardians as St. Francis of Assisi. My friend is a very intelligent person with good critical abilities, is a writer and scientist, financial officer, and has the respect of her friends and colleagues wherever she has lived because she is passionate about the work she undertakes. She is noted for getting to the truth of messy situations and acting as an ombudsman for organizations in trouble. She also gets along well with those with whom she works in a volunteer capacity, and I’m shaking my head this morning at the audacity of this group of people who “dissed” her and who call themselves family. Perhaps family is the place you go when no one else will take you in, to paraphrase Robert Frost, but in my friend’s case, everyone else takes her in except these relatives. To further expand on this group of clannish hypocrites, they’re among those who advocate family values in the political arena. However, the word "love" is never mentioned in their conversations, and I've been privy to those conversations for almost 35 years now. “Family means no one gets left behind” – but in the case of my friend, she was left behind, booted out of a position that she had held for over a decade simply because someone else wanted her job. She is, at the moment, trying to get an early flight out of the toxic family atmosphere. As Scott Peck advocates in his People of the Lie, there are occasions when a person who meets up with evil in her family feels immediate repulsion and should run like heck in the other direction. It seems that because my friend stood up and spoke the truth about family operations, because she wanted to perform the job she had been elected to do, she was nailed. She has gradually been edged out of a position in a behind-the-scenes coup, by control seeking, power and money advocates who call themselves Christians and some of whom belong to the Christian right. One of the criticisms leveled at my friend was that she thought she was smarter than they were, which, to me, denotes one of the seven deadly sins: Envy. Then there’s Pride, Greed, Sloth… to name a few more that were committed by this scheming group. If these people are religious and believe in the so-called final Judgment and personal accountability, it appears otherwise --their Bible thumping seems just a way to make a loud noise. And if all this sounds appalling, sadly it is a true story about a post-modern family. I look out at St. Francis and await my friend’s arrival. According to a clipping on my fridge, St. Francis would tell her, “Be at peace. Do not look forward in fear to the changes of life; rather look to them with full hope as they arise. God, whose very own you are, will deliver you from out of them. He has kept you hitherto, and He will lead you safely through all things…” He might have added that evildoers gradually unravel and destroy themselves.